Denby stoneware is handmade in England using locally sourced clay. With skills handed down over 2 centuries, Denby’s craftsmen create wonderfully unique tableware which is incredibly durable, distinctive and stylish. Philip Morris & Son offer fantastic discounts across the Denby ranges and we are also offering free delivery on all Denby purchases over £25.00! The calming and tranquil Regency Green range is one of Denby’s most well known ranges, featuring refreshing natural green watercolours. Selected items including the tea cup, saucer, cereal bowl, pasta bowl, salad plate and dinner plate are currently discounted by 50% off RRP! 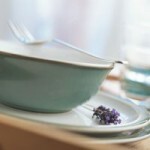 All ranges of Denby stoneware, including Regency Green, are safe to use in the oven, microwave, freezer and dishwasher. The iconic Imperial Blue range is 25 years in the making, combining brilliant blues and fresh whites for a bright and bold collection of dinnerware. 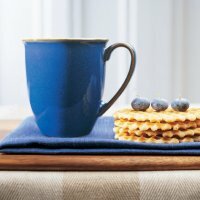 The Imperial Blue range also has 50% off RRP on selected lines, including several sizes of plates and bowls, tea cups and saucers and the fantastic coffee mug perfect for a stylish cuppa! Imperial Blue is the very definition of a timeless classic! The unique Halo range is hand-decorated, which means no two pieces will ever be exactly the same. 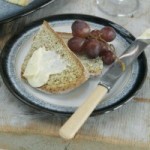 This range is currently on sale at 40% off RRP and includes a wonderful selection of dinnerware. There are 3 different sized plates to choose from – tea plate, salad plate and dinner plate – and three different sized bowls – pasta bowl, cereal bowl and the distinctive rice bowl. Also in the Halo range are 2 different sized mugs, the small mug is perfect for a cappucino or similar, whereas the large mug is ideal for an indulgent cup of hot chocolate! 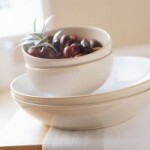 The Denby Linen range is an understated classic with neutral tones that are as uncomplicated as they are charming. The real beauty of the Linen collection lies in its simplicity and its light, subtle tones mean that this dinnerware will suit almost any kitchen or dining environment. The Linen range is currently reduced by 50% off RRP on selected lines. The simplistic chic of Denby Linen belies the attention to detail that goes into each piece, including hand painted plate rims! A lthough Denby are famous for their strong and stylish stoneware, they are by no means a one-trick pony and their fine chinaware is testament to that. The elegant Denby Monsoon Lucille Gold collection boasts a 1950’s-inspired shimmering gold lace pattern on soft cream china. Selected Lucille Gold pieces are currently 50% off RRP while stocks last. Denby Monsoon fine china is fully vitrified for strength and durability. To add the perfect finishing touch to your Denby collection, Denby glassware and tablemats have been specifically designed to complement your tableware with co-ordinating colours and compatible shapes. 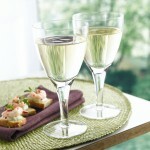 All Denby glassware is currently half price and Denby Lifestyle Colours placemats and coasters are also half price. 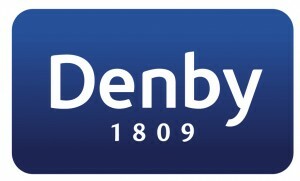 * Please note: Denby promotions are only available whilst stock lasts and all prices are subject to change. 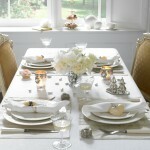 Denby, Denby Glassware, Denby Promotion, Halo, Imperial Blue, Line, Lucille Gold, Regency Green. Bookmark.